Transport open bottom pallets, skids, baskets, and crates with ease. 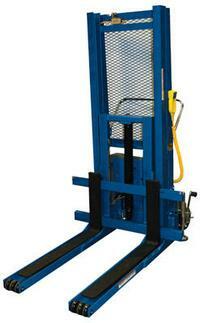 Features an 18" horizontal load center and overall fork width of 26". Units roll smoothly on 6" x 2" swivel phenolic rear casters. Handle height is 40". Features 12V DC power standard with on-board charger (Pic. 3) . AC and Air is also available.